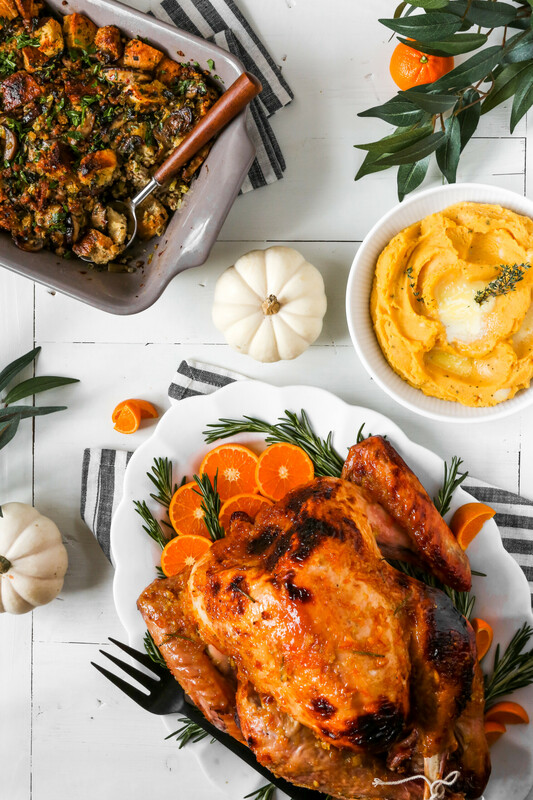 Just 7 ingredients and 30 minutes is all you need to whip up these festive and flavorful mashed potatoes. 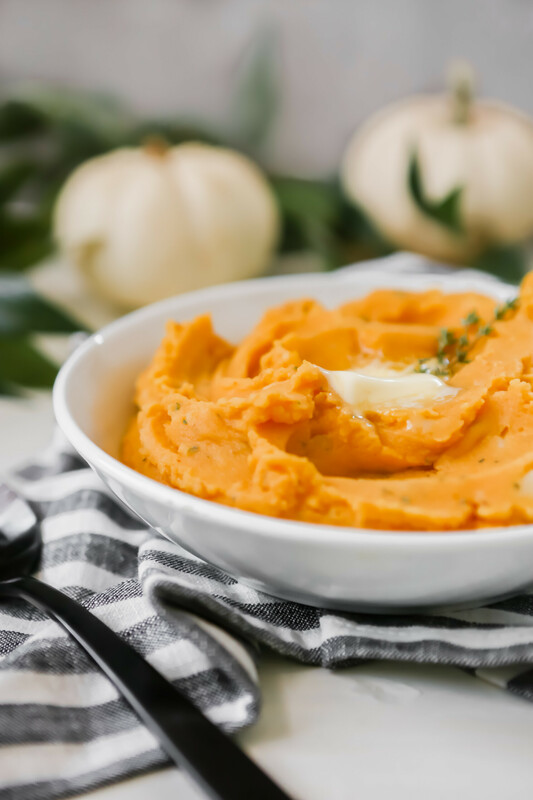 Right at home on the Thanksgiving table, these pumpkin mashed potatoes are a great addition to any fall or winter meal as well. Mashed potatoes are undoubtedly always a hit. No matter the season or occasion, they offer a sense of comfort to just about any meal. But just because they’re a hit, and only require a few ingredients, doesn’t mean they don’t come with their challenges. And I know that sounds crazy, since we’re talking about mashed potatoes after all, but hear me out. I find mashed potatoes are either lackluster—dry and flavorless—or so decadent that you wonder how you’ll ever recover from so much butter and cream. I like my mashed potatoes somewhere in the middle, unless, of course, I’m eating a small portion at a fancy small-plate restaurant, then in that case bring on the cream. 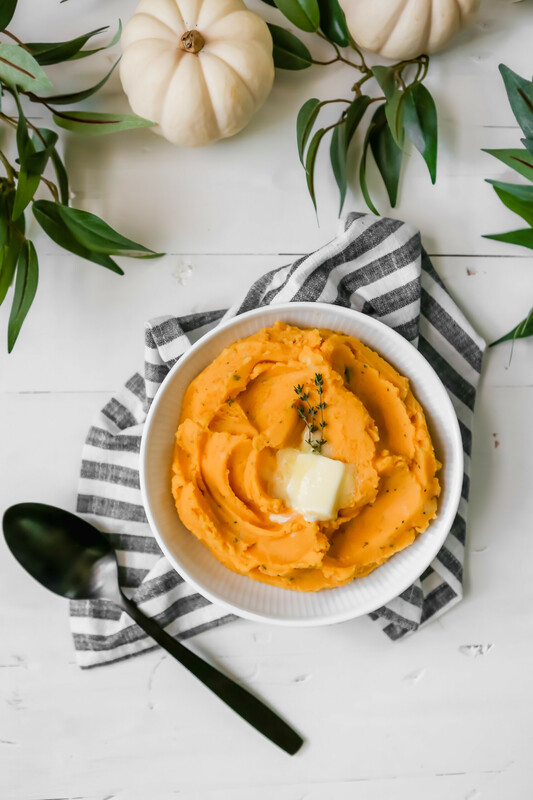 These pumpkin mashed potatoes are healthier than most since they’re made with quite a bit of pumpkin, buttermilk (which is naturally low-fat) and just a touch of butter. The buttermilk is key in this recipe because it adds body and flavor, while the fat from the butter is essential for a smooth, creamy consistency. Both are non negotiable ingredients. When it comes to flavorings, you can swap in whatever herbs or spices you like. I found fresh thyme paired perfectly with the pumpkin and buttermilk, but sage or rosemary would work wonderfully too. And if you don’t have white pepper, no problem, just skip it and be a little more generous with the black pepper. How do you make perfect mashed potatoes? 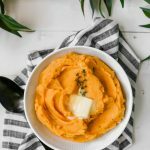 Just like regular mashed potatoes, making pumpkin mashed potatoes is a simple task that benefits from a bit of intention. What do I mean by that? Oh you think I’m a crazy potato lady? What I mean by cooking with intention is that the task itself is pretty darn simple but there are a few things to keep in mind to achieve an end result that’s as good as it can be, I talk about them below. Make sure you cut your potatoes into similar-sized pieces. This ensures even cooking throughout. No one likes to bite into an undercooked potato. Adding potatoes to a pot of cold water and then bringing it to a boil helps the potatoes to cook from the inside out, which makes for more evenly cooked and better textured potatoes. Don’t overwork the cooked potatoes. For this recipes you mash the potatoes before folding in the remaining ingredients. Folding the potatoes together ensures they don’t become tough or gluey. Be generous with the seasonings. Potatoes can take a lot of salt. The one thing I find most often in home cooking is that people don’t season throughout the cooking process and they don’t season enough. For mashed potatoes it’s important to heavily season the cooking water as well as the finished product. Taste as you season—that’s the only way to know if it’s seasoned properly. Can you make mashed potatoes ahead? And how long do they last? Although mashed potatoes are best served right away, they can be made up to 3 days ahead. Follow the recipe all the way through, being sure not to over mix the potatoes. When ready to reheat transfer potatoes to a baking dish, pour a few tablespoons of melted butter and buttermilk over top, cover with foil, and transfer to an oven heated to 350°. Bake potatoes until heated through, stir to combine and serve. 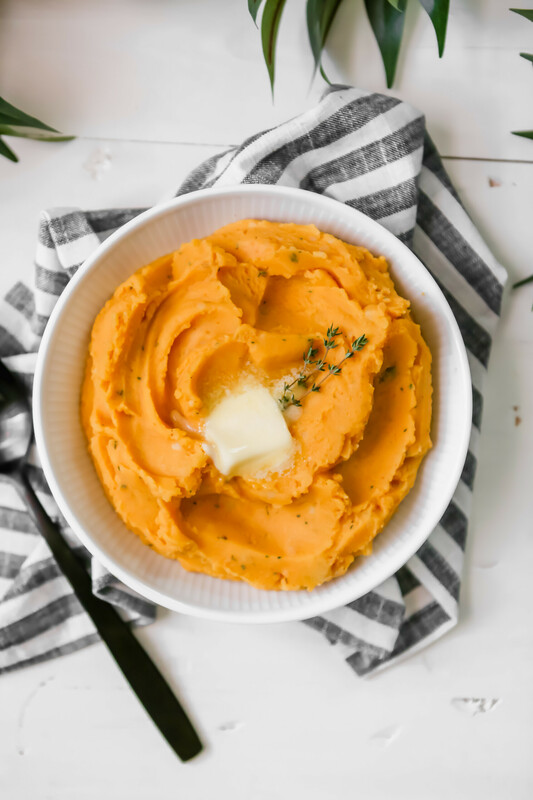 These 7-ingredient creamy Buttermilk Pumpkin Mashed Potatoes are flavorful, festive and so easy to make. 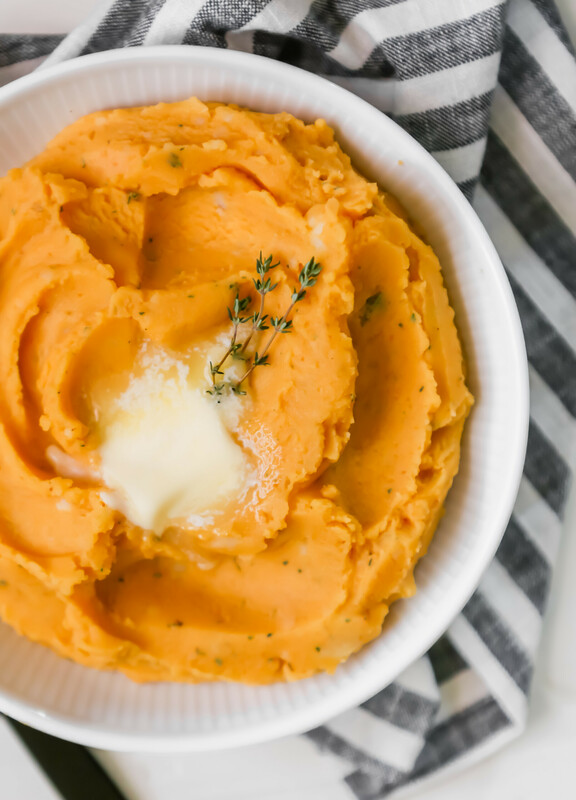 Ready in just 30 minutes, these mashed potatoes are a great addition to any fall or holiday meal. Add potatoes to a large pot, cover with 1 inch of water and stir in 1 tablespoon salt. Bring water to a boil over high heat, then reduce heat to medium and simmer until potatoes break apart when pierced with a paring knife or fork, 15–18 minutes. Meanwhile, combine pumpkin, buttermilk, butter, thyme, nutmeg, and white pepper in a bowl; set aside. Drain potatoes, then return to pot set over low heat. Using a potato masher, mash potatoes until only a few small lumps remain. Remove pot from heat, add pumpkin mixture to mashed potatoes and, using a rubber spatula, gently fold until just combined. Season potatoes with salt and pepper and serve. I have listed that you can use russet or Yukon Gold potatoes in the recipe. 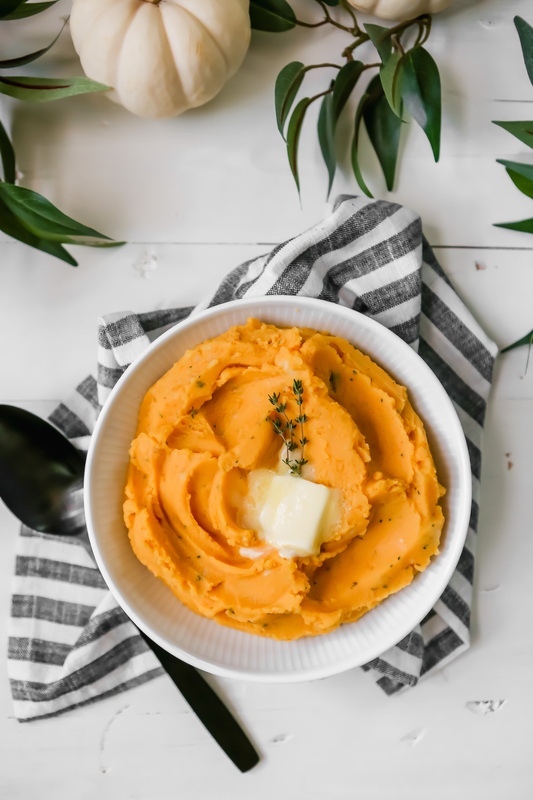 Yukon Gold potatoes are less starchy than russets which mean they absorb less water throughout the cooking process, making for more silky mashed potatoes. 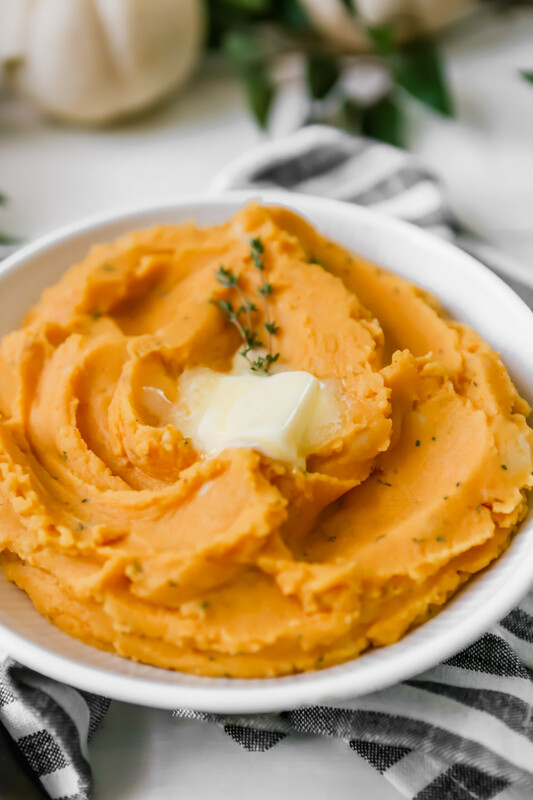 However, starchier russets are classic when it comes to mashed potatoes and they’ll work just as well, maybe just have a little extra butter on hand.